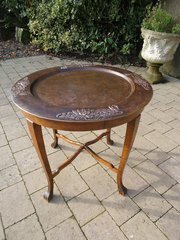 Unusual walnut and copper tea table in the Arts & Crafts style. The copper tray sits on the table and is useful to lift off and carry contents away. Offered in good condition. Height 60cms. 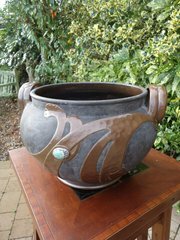 Diameter 67cms. 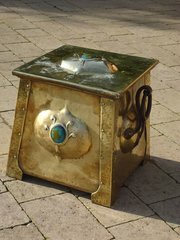 Stunning Arts & Crafts brass coal box with a large ceramic cabochon to top and front. It has lovely strong wrought iron handles with rings. There is a tin liner but it does have a few small holes. Otherwise offered in a good original condition commensurate with use. Height 37cms. Width 35cms. Depth 33cms. Pretty Arts & Crafts oak casket with a lovely copper repousse top of honesty and the words cigarettes. So much part of the Arts & Crafts period when smoking was in vogue. 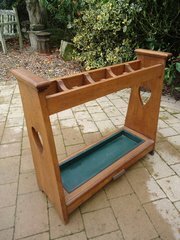 Offered in good condition with just a minor split to wood at hinge. Height 4cms. Width 18cms. Depth 12cms. Arts & Crafts Glasgow school Celtic knot rectangular brass mirror. The brass has a nice bronzed patina. The mirror has its original bevelled edged mirror plate. Offered in a good original condition. It has a metal back and is hung as landscape. The frame measures 58cms x 38cms. Arts & Crafts Bretby jardiniere. 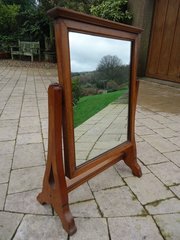 Elegant Arts & Crafts walnut toilet mirror. A Lovely design with a pierced teardrop to the sides. The mirror stays firmly in place. Offered in good condition. Total height 61cms. Width 43cms. Depth 20cms. The mirror section is 47cms x 36cms. Unusual Arts & Crafts Newlyn school copper covered pair of clothes brushes and hand mirror all with a grotesque dragon to the back. Incised initials SBG to one brush. The mirror has a bevelled edged plate with minor spotting and measures 21cms long and 7cms wide. The brushes are 13cms x 6cms. The copper covers on the brushes is loose and can be removed for cleaning. Matched pair of Goberg wrought iron candle holders by Hugo Coberg- one being slightly darker in colour than the other. Both measure 19cms high and have a diameter of 14cms at the base. One is stamped Coberg. Postage within the U.K. only included. Not internationally. 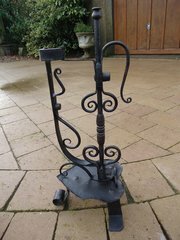 Tall Arts & Crafts wrought iron candle holder with a spring to hold the candle in place. A lovely design with a heart shaped dip tray. Height 46cm. Width 15cms. Depth 19cms. Offered in good original condition. Most probably English but could be German. A lovely and unusual design. 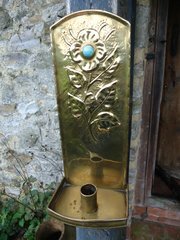 Pretty Arts & Crafts brass sconce with a branch of leaves with the flower head having a cabochon to the centre. It has a ring to the back and a good sized drip tray. Offered in good condition but with some surface scratching due to a previous owner over cleaning. The soldering appears to have been there since the time of its making. Height 29cms. Width 13cms. Depth 9cms. 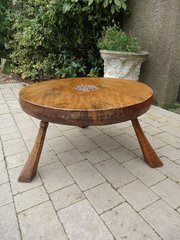 Arts & Crafts burr elm coffee table made by Jack Grimble of Cromer around 1970. It stands on three legs and the top is a superb piece of elm and is 8cms thick. It has a Tudor rose carved into the centre and Jack's signature is carved into the underside. A lovely piece of craftsmanship from a maker no longer with us. Height 47cms. The top is 79cms in diameter. Arts & Crafts oak stick stand as retailed by Liberty with a pierced heart to both ends. It has its original heavy metal drip tray. Offered in good original condition with just one historical split to one end. Good heavy quality item. Height 70cms. Width 80cms. Depth at base 20cms.